How is the Guinness advert designed to sell Guinness to the target audience? How is the Guinness advert designed to sell Guinness to the target audience? This Guinness advert uses a vast range of advertising techniques to sell Guinness to its target audience. The most important and effective technique used to sell Guinness is the role model, Marco, this is because Marco has defied the stereotype of an 'Old Man' e.g. walking sticks and moaning all the time, but instead he is very healthy, attractive for his age and well known in his area. This is every older man's dream, so by giving men the notion that they will be fit, healthy, attractive and well known by drinking Guinness, helps to sell Guinness a lot more to the target audience of 'an older man'. Guinness uses the role model, Marco, as an effective and compelling role model for the target audience of older men. Marco is a very well known person in the village that he lives in. ...read more. This way of advertising also attracts a younger target audience as younger people tend to be more sympathetic than adults, and they may persuade their parents/guardians to buy Guinness. The technique used by Guinness to sell Guinness to the target audience, subordinate to the role model, is the use of language. 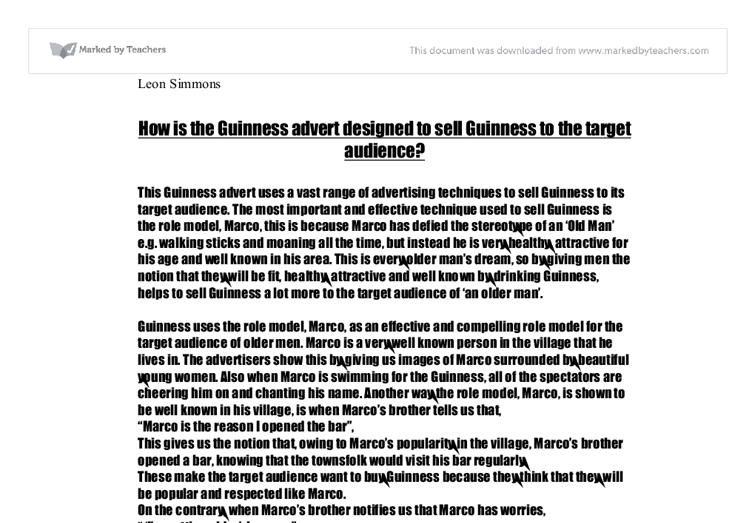 The Guinness advertisers most effective use of language is the voice over for Marco's brother. His voice is low, almost a drone, but it has feeling and emotion, and this is present when Marco's brother is telling us how Marco has worries of getting older. 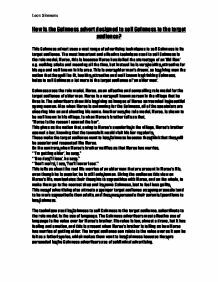 The target audience can relate to the voice over as it can be felt as a fatherly voice, which makes them want to buy Guinness because they are persuaded by the Guinness advertisers use of subliminal advertising. A very important technique used by the Guinness advertisers is the use of camera shots throughout the advert. For example, the camera shots help to set the scene. ...read more. This tells the audience that Marco is a champion and is successful, and also still is because he has drunk Guinness throughout his life. This shot is a mid-shot as it allows the audience to see Marco's medals in detail. In summary, the camera shots do two important things. Firstly, the shots emphasise the people's adoration of Marco and his importance as a role model who will encourage the audience to but Guinness. Secondly close-ups are also used to emphasise the importance of the drink itself. In conclusion it can be seen that the makers of this advert have used a range of media techniques to persuade the audience to go out and buy Guinness. I still feel that the most important technique used by the Guinness advertisers is the creation of a role model, Marco, who represents everything that his middle-aged audience would want to be. He is still successful, fit and adored. Marco's audience would also empathise with his vulnerabilities over getting older and frailer. So the audience are being persuaded to buy Guinness on two contrasting, but effective, ways. Leon Simmons ...read more. In this time the audience also feels a lot of sympathy for Ken because they want the judge to listen to what he is saying. The staging is another important thing which creates sympathy and empathy for Ken. The actions of the play are continuous, the only break is the interval. It also gets to point across straight away; this is why it is suitable for this type of writing, as it is instructions so they have to be short.. Proper nouns are used usually to state someone's name or to give the name of a place. Not much lighting is used, and only a narrow shaft of sunlight coming through the bedroom window and a candle flame lights the room. The fact that it is dark captures the audience's attention because of the associations with darkness.